Even A dummys guide couldnt be written for this project! 1 Even A dummys guide couldnt be written for this project! 3 Getting through your group project.. 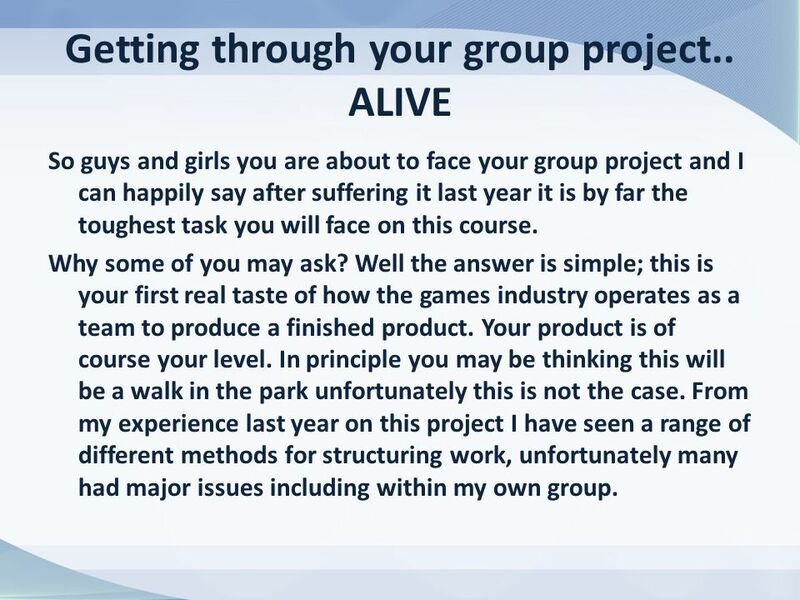 ALIVE So guys and girls you are about to face your group project and I can happily say after suffering it last year it is by far the toughest task you will face on this course. Why some of you may ask? Well the answer is simple; this is your first real taste of how the games industry operates as a team to produce a finished product. Your product is of course your level. In principle you may be thinking this will be a walk in the park unfortunately this is not the case. 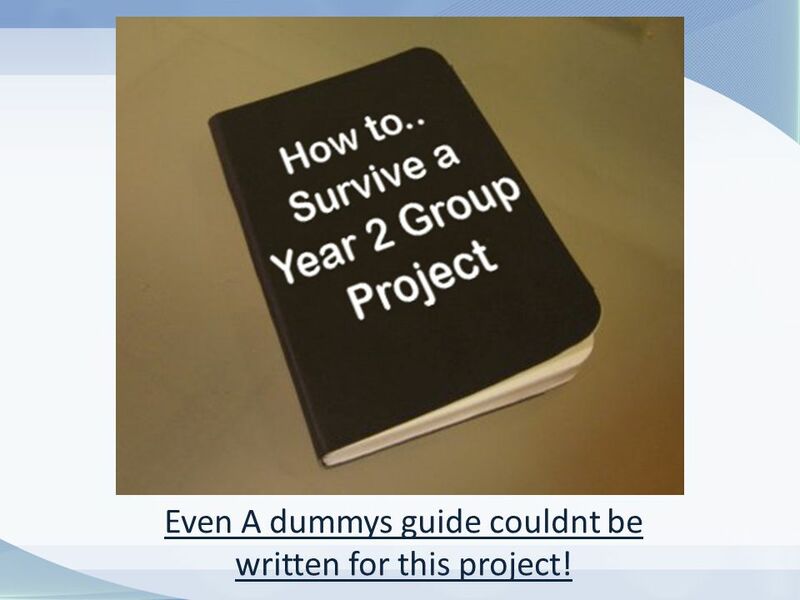 From my experience last year on this project I have seen a range of different methods for structuring work, unfortunately many had major issues including within my own group. 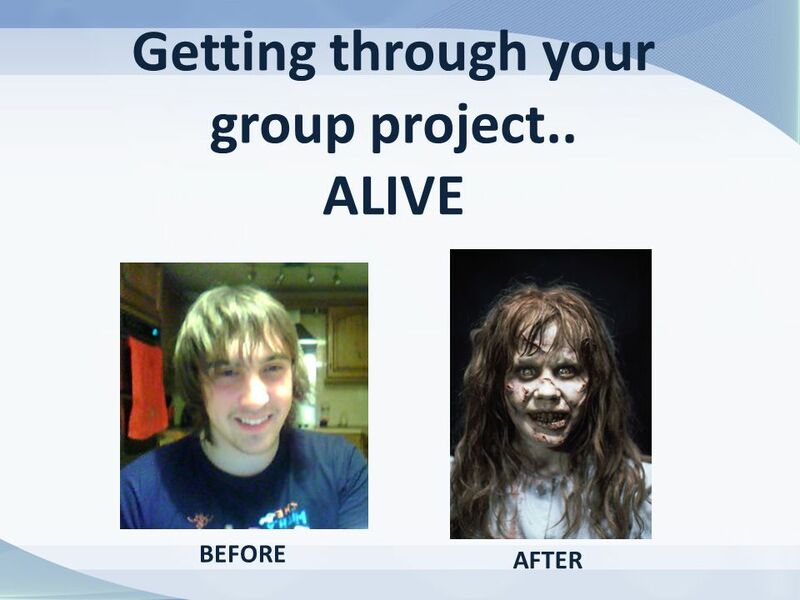 4 Getting through your group project.. 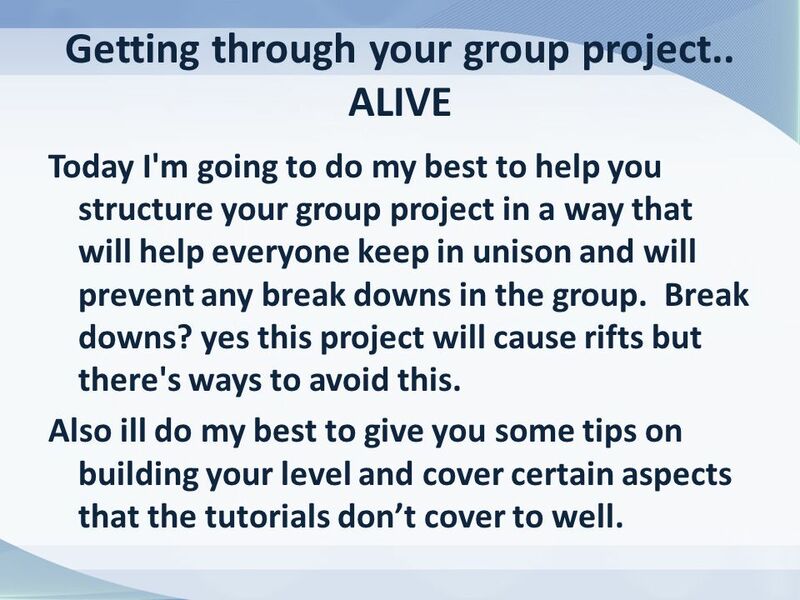 ALIVE Today I'm going to do my best to help you structure your group project in a way that will help everyone keep in unison and will prevent any break downs in the group. Break downs? 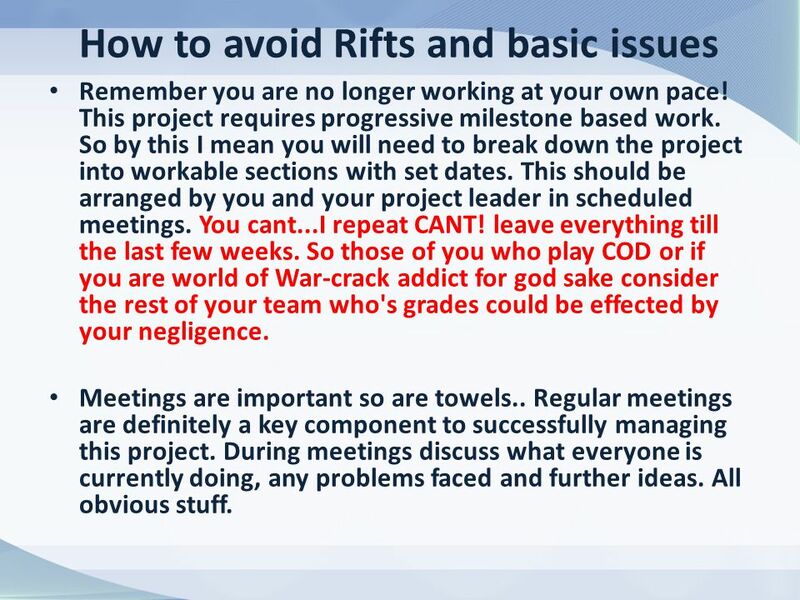 yes this project will cause rifts but there's ways to avoid this. Also ill do my best to give you some tips on building your level and cover certain aspects that the tutorials don’t cover to well. 6 How to avoid Rifts and basic issues Remember you are no longer working at your own pace! This project requires progressive milestone based work. 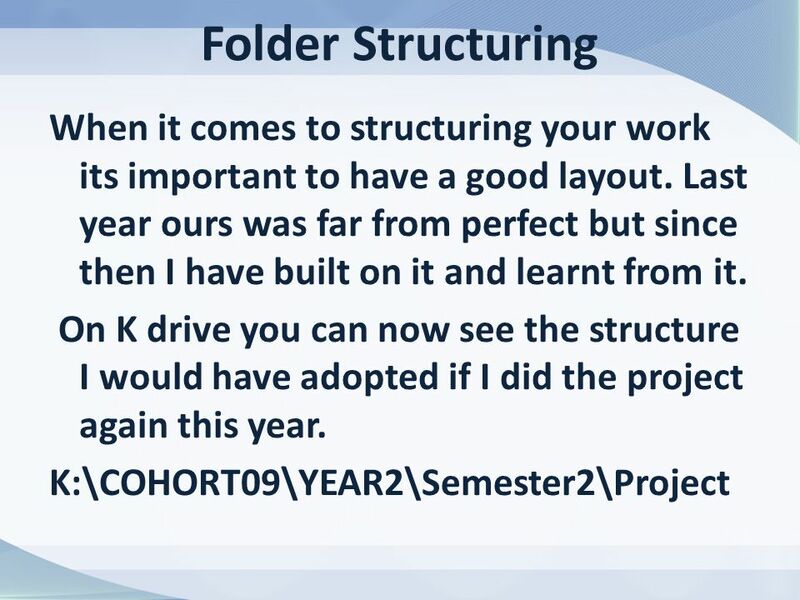 So by this I mean you will need to break down the project into workable sections with set dates. This should be arranged by you and your project leader in scheduled meetings. You cant...I repeat CANT! leave everything till the last few weeks. So those of you who play COD or if you are world of War-crack addict for god sake consider the rest of your team who's grades could be effected by your negligence. Meetings are important so are towels.. Regular meetings are definitely a key component to successfully managing this project. During meetings discuss what everyone is currently doing, any problems faced and further ideas. All obvious stuff. 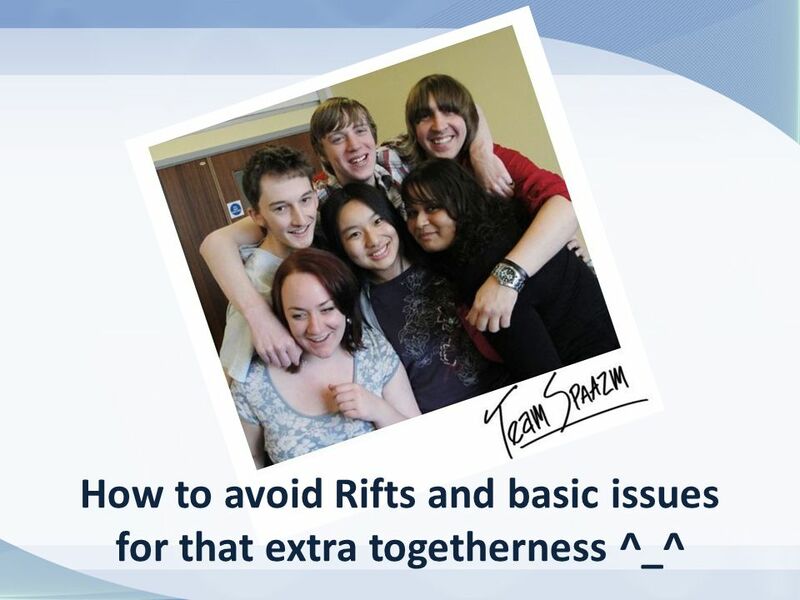 7 How to avoid Rifts and basic issues Keep your work tidy and in the appropriate folders. We'll be going over file structuring in a second but it is important to hammer that home early. 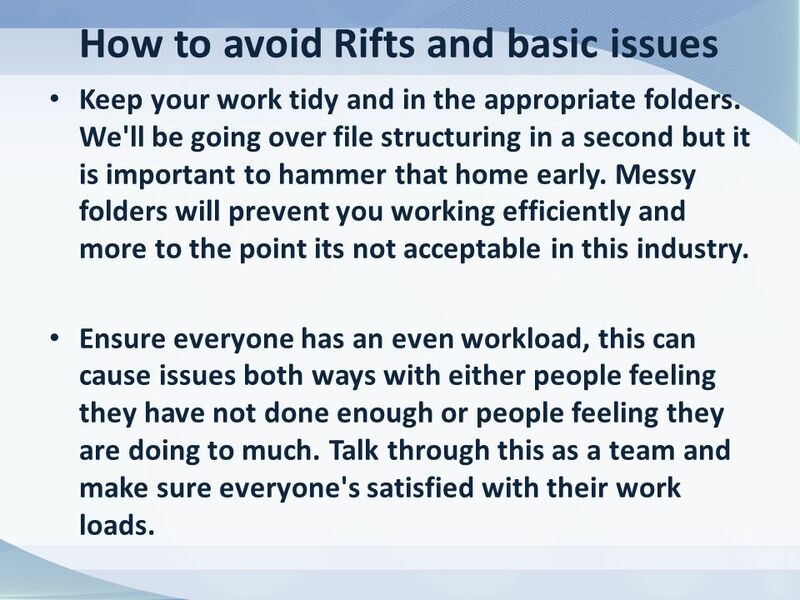 Messy folders will prevent you working efficiently and more to the point its not acceptable in this industry. Ensure everyone has an even workload, this can cause issues both ways with either people feeling they have not done enough or people feeling they are doing to much. 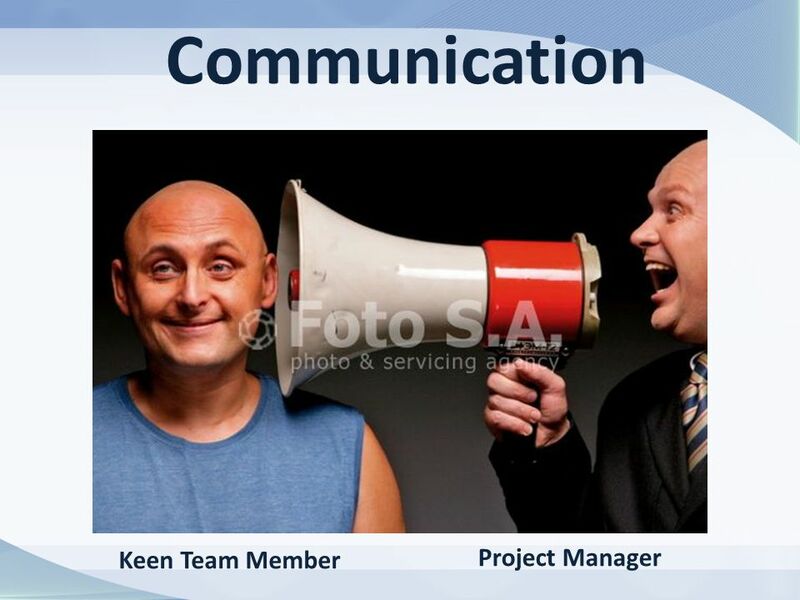 Talk through this as a team and make sure everyone's satisfied with their work loads. 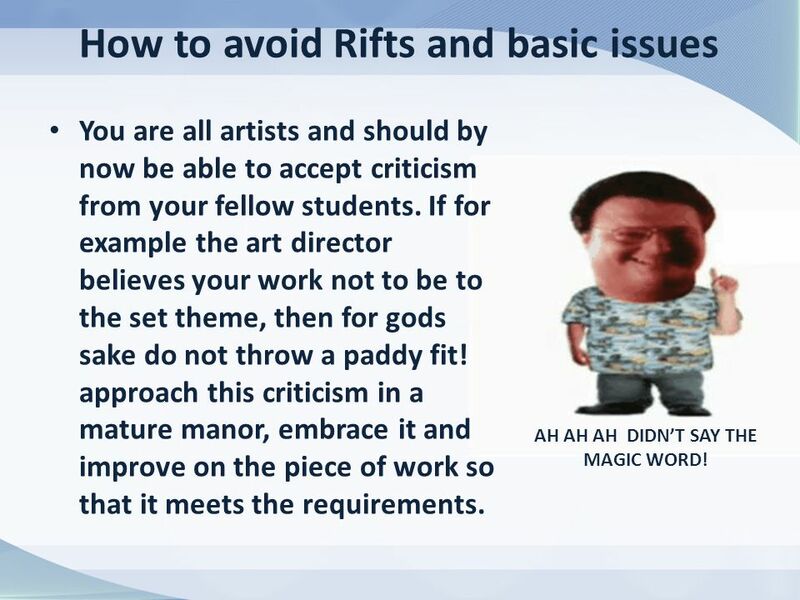 8 How to avoid Rifts and basic issues You are all artists and should by now be able to accept criticism from your fellow students. If for example the art director believes your work not to be to the set theme, then for gods sake do not throw a paddy fit! approach this criticism in a mature manor, embrace it and improve on the piece of work so that it meets the requirements. AH AH AH DIDN’T SAY THE MAGIC WORD! 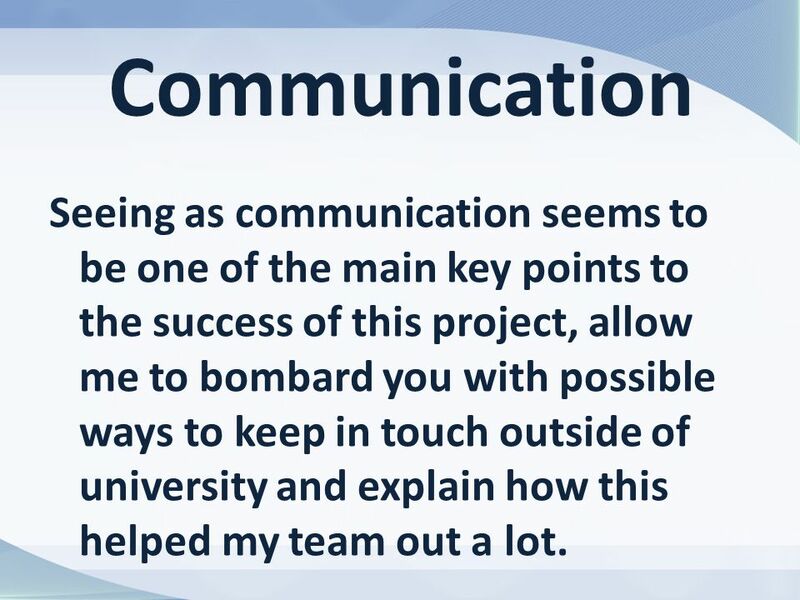 10 Communication Seeing as communication seems to be one of the main key points to the success of this project, allow me to bombard you with possible ways to keep in touch outside of university and explain how this helped my team out a lot. 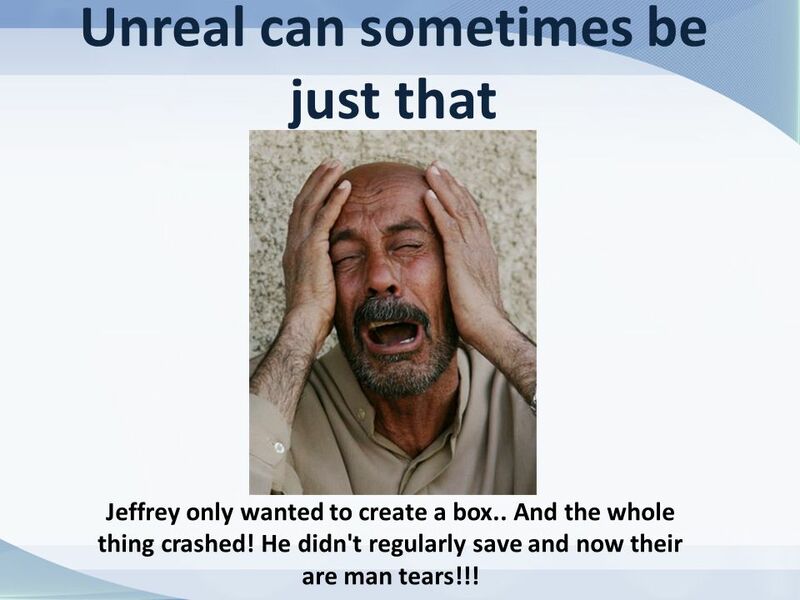 15 Unreal can sometimes be just that Jeffrey only wanted to create a box.. And the whole thing crashed! He didn't regularly save and now their are man tears!!! 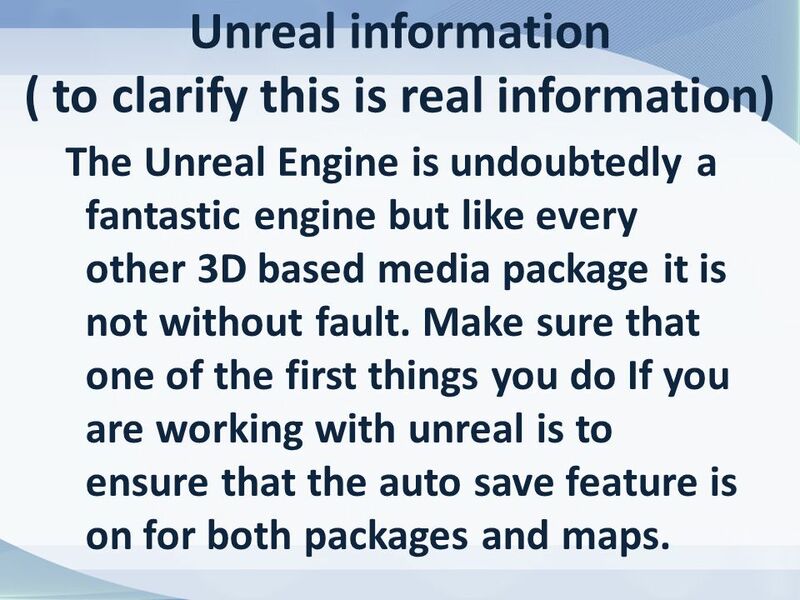 16 Unreal information ( to clarify this is real information) The Unreal Engine is undoubtedly a fantastic engine but like every other 3D based media package it is not without fault. Make sure that one of the first things you do If you are working with unreal is to ensure that the auto save feature is on for both packages and maps. 17 BSP for the win! 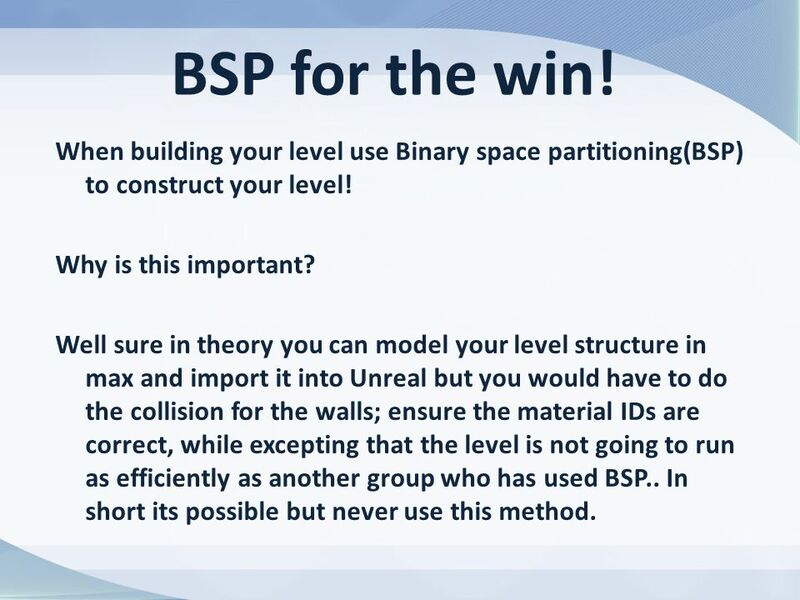 When building your level use Binary space partitioning(BSP) to construct your level! Why is this important? Well sure in theory you can model your level structure in max and import it into Unreal but you would have to do the collision for the walls; ensure the material IDs are correct, while excepting that the level is not going to run as efficiently as another group who has used BSP.. In short its possible but never use this method. 18 BSP for the win! 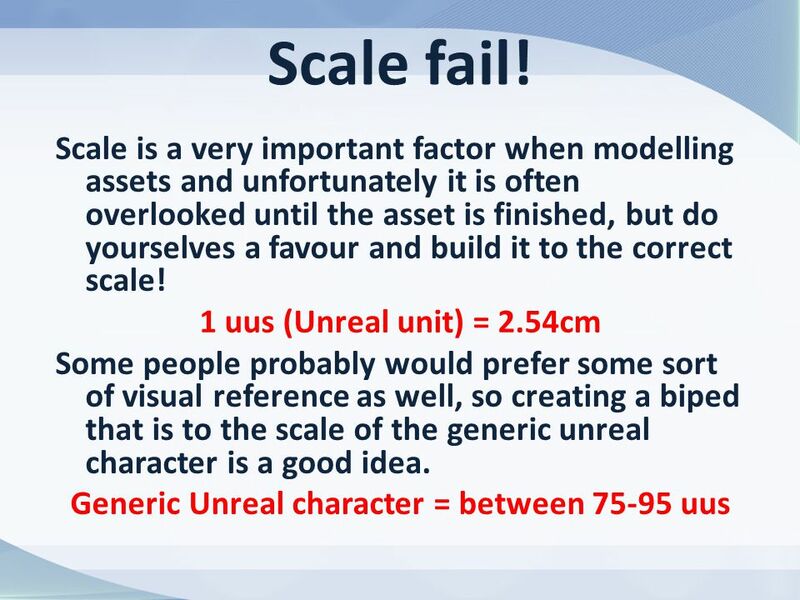 I do however recommend building your level in max first to get the scale correct. normally enlarge this by 1.5x and in doing this you should avoid corridors that are to narrow. However if you are going for a claustrophobic angle with your level then you may not want to enlarge it more than is necessary its entirely up to you. 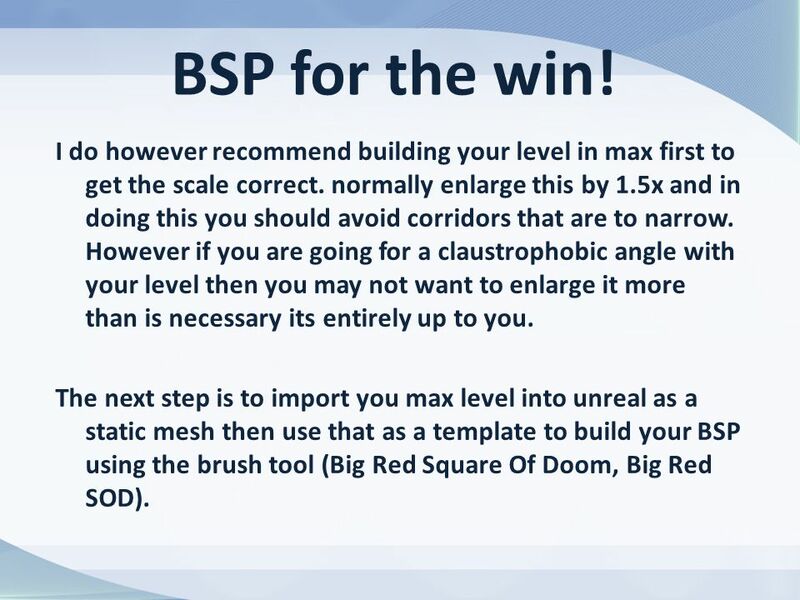 The next step is to import you max level into unreal as a static mesh then use that as a template to build your BSP using the brush tool (Big Red Square Of Doom, Big Red SOD). 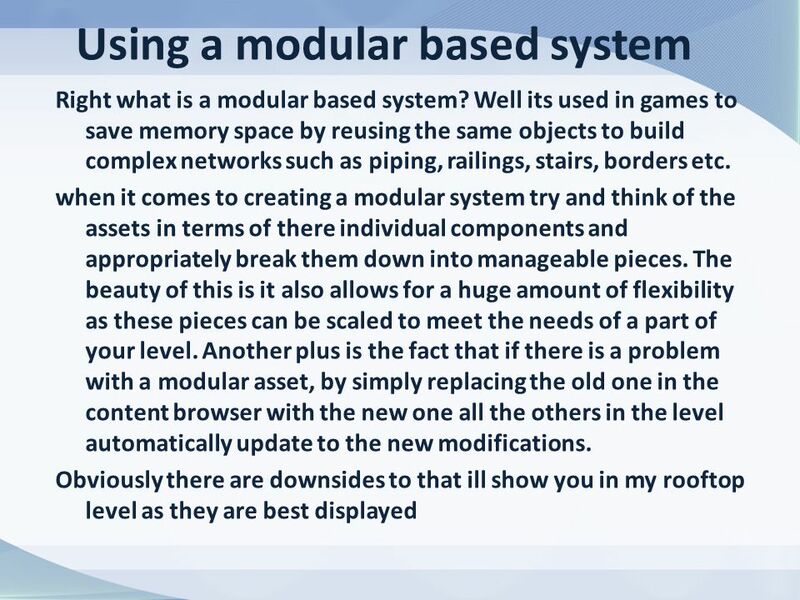 21 Right what is a modular based system? Well its used in games to save memory space by reusing the same objects to build complex networks such as piping, railings, stairs, borders etc. 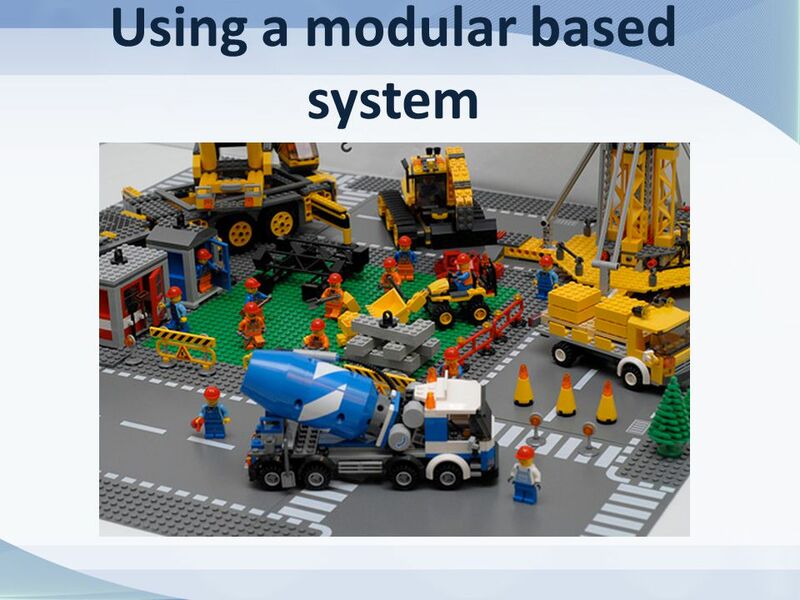 when it comes to creating a modular system try and think of the assets in terms of there individual components and appropriately break them down into manageable pieces. The beauty of this is it also allows for a huge amount of flexibility as these pieces can be scaled to meet the needs of a part of your level. Another plus is if there is a problem with a modular asset, by simply replacing the old one in the content browser with the new one, all the others in the level automatically update to the new modifications. Obviously there are downsides to that ill show you in my rooftop level as they are best displayed. 24 Basics to remember 1.Don’t forget to position you pivot point in the correct positions and centred to 0,0,0 this is pivotal. 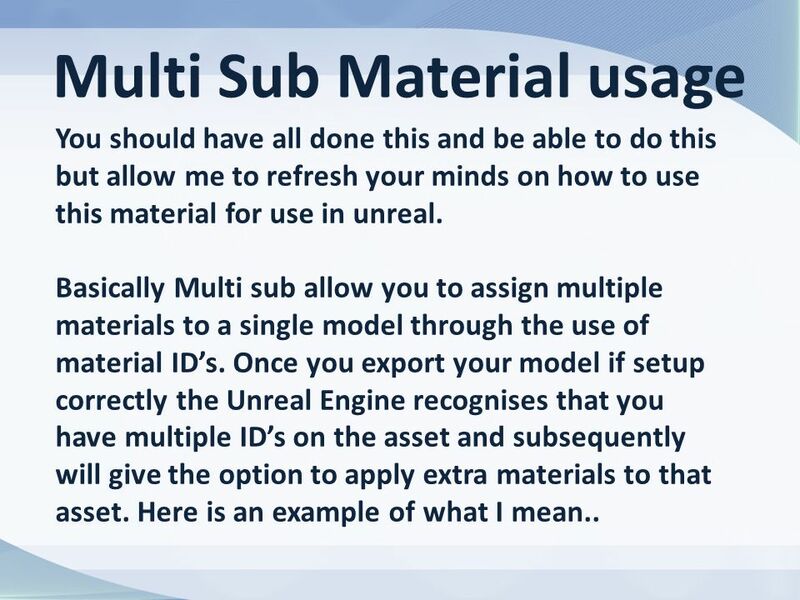 ^_^ 2.Make sure if you are using multi sub object that all your materials are labelled otherwise unreal wont recognise them! (If your not sure about multi sub/object is give me a shout and id be glad to walk your through it) 3.Don't end up like Jeffrey, save regularly and backup the files often in case of corruption. I recommend at least keeping 2-3 increments of your backups just to be on the safe side. 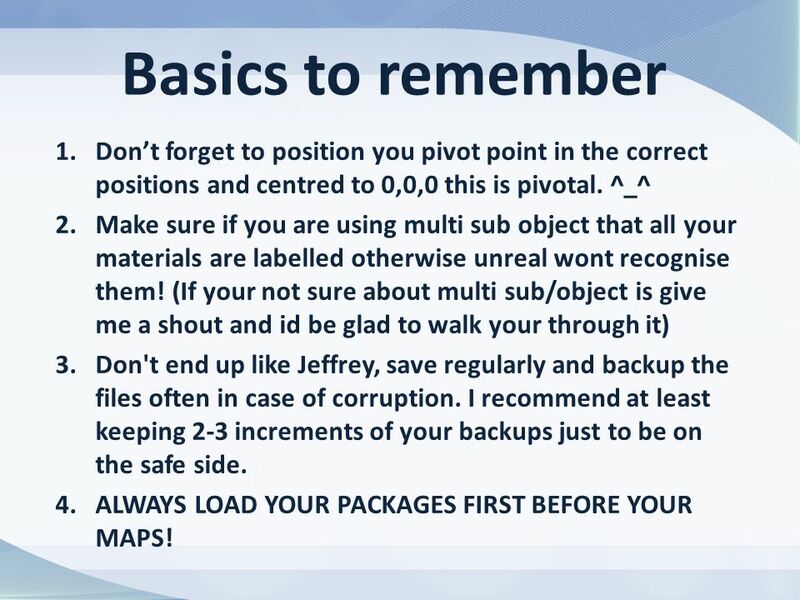 4.ALWAYS LOAD YOUR PACKAGES FIRST BEFORE YOUR MAPS! 25 Thank you for watching hope I've been of some help! 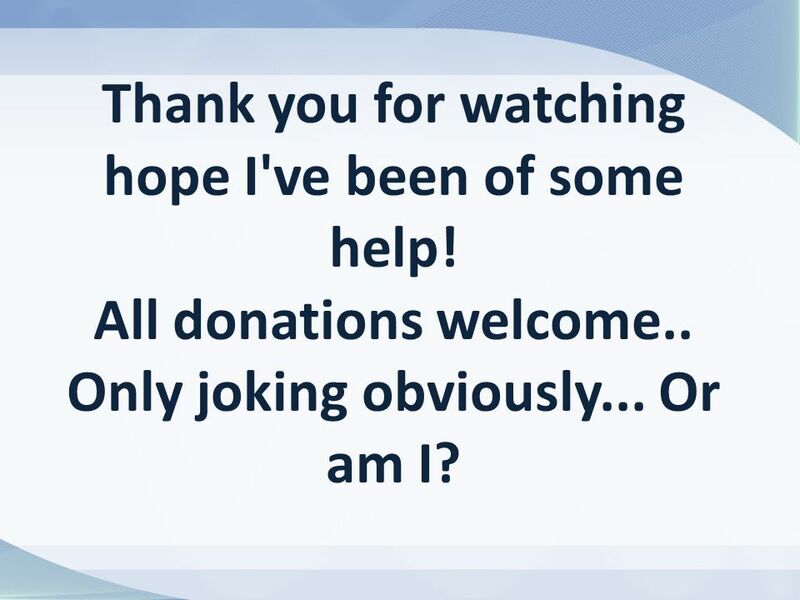 All donations welcome.. Only joking obviously... Or am I? 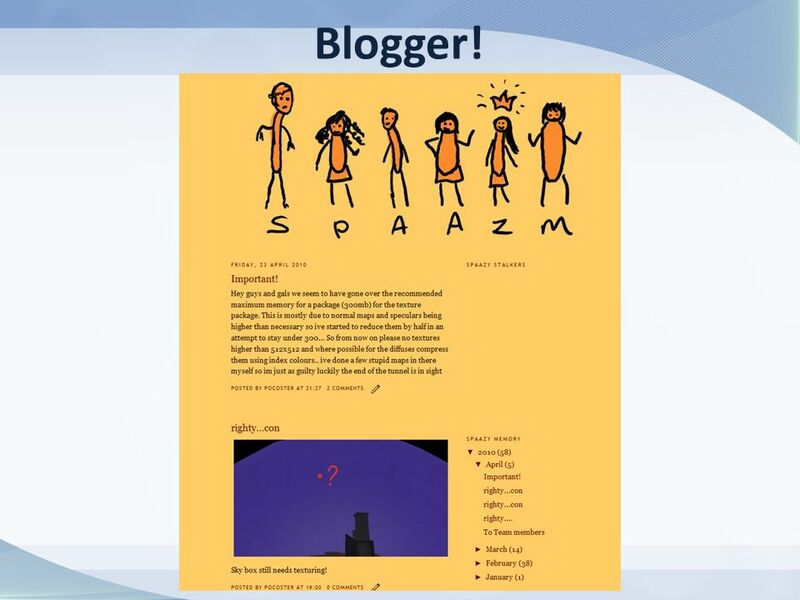 Download ppt "Even A dummys guide couldnt be written for this project!" Audio-feedback Background – why I did it. My experiences – what I did. Student feedback – how did it go? Welcome to 5 th Grade! Getting to know one another! LightWave 8 Model Processing and Clean Up By Adam Bava Chico State Game Studios. File Management and Storage Devices. Floppy Disk Drive ► A floppy drive (normally designated as the "A" drive). ► A floppy drive (normally designated. Language of Meetings PPTX What needs to be said?. In an internet browser type: If you have never used this software before, click on create an account. If you have used ilrn, click on Sign. E28: Design Notebooks Role Playing Exercise in Gender Equity and Inclusion in Team-based Design Classes. Downloading and Installing AutoCAD Architecture 2015 This is a 4 step process 1.Register with the Autodesk Student Community 2.Downloading the software.  1993 – Wake County adopts the following eight character traits to promote the importance of character education in the classroom and to help create. I Can Make it Happen!. Welcome DVD What is ‘I Can Make it Happen’? A programme of activities to help you: be aware of the different things you might.